The birdhouse in this picture was created with white poplar and a brown leaf. The squirrel was created with cardinal flower and ornamental grass blossom. The garden features speedwell, butterfly weed, salvia, deutzia and silver poplar leaves. 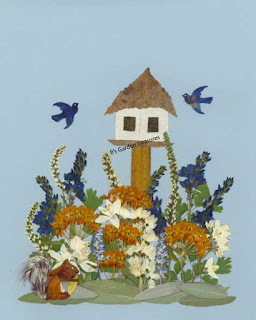 The birds were from delphinium. This picture measures 11" x 14"framed. This original was sold at the Christkindle Show in Canandaigue. It is currently available as an 11" x 14" matted frame-ready print.